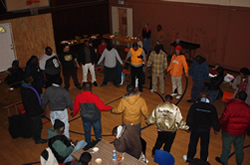 We are I Am My Brother's Keeper Ministries. We are a body of believers whose lives are being profoundly impacted by the love of Christ. We come from a variety of dark and shameful backgrounds, but we all share in this same most-glorious truth: God has shown His grace toward each of us through His only begotten Son, Jesus, the anointed. We therefore, as recipients of His grace, strive to share that same grace with all humanity as He grants us the opportunity—especially the poor. 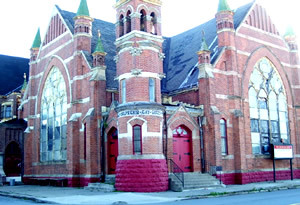 The church and its pastor, Henry Covington, were a focus of Mitch Albom's international bestseller "Have A Little Faith," which chronicled Pastor Covington's unique path as well as the congregation and the hole in the church roof that went unfixed for years. "Have A Little Faith" and "A Hole In The Roof" unite to help close the famous hole once and for all. Thanks to the book "Have A Little Faith" and the foundation formed by its author Mitch Albom, A Hole In The Roof, donations from around the world came in to help repair the giant roof hole in the sanctuary. On Monday, November 23rd, 2009, construction began. The completion—and a celebration of it—took place Wednesday, December 9th, 2009. We Are Our Brother's Keeper! We are an urban ministry on a mission of love.